Lately, I've been trying to find good vegetarian recipes to make. Don't get me wrong, I love my chicken, fish, and the occasional piece of beef, but on those occasions where I have to cook for vegetarians, I'd prefer not to have to go and find fake meat in order to make dinner. So, enter recipes that include pasta, whole grains, and lots of yummy vegetables. I've got a whole boardful of them on Pinterest just waiting to be made. But, since there was sale on eggplant, I decided to start with the Baked Orzo with Vegetables. 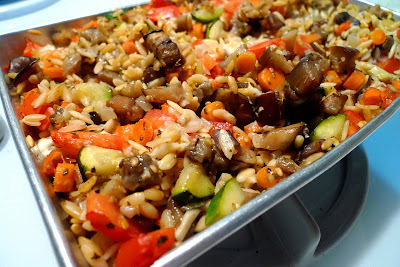 This recipe is not necessarily the quickest to make, since you have to chop all the veggies and also salt the eggplant, then let it sit for half an hour. But, I promise that all the work is worth it. I did make a few changes to the recipe. For one thing, I had a zucchini sitting in my fridge, so I added that in. I also left out the celery because I didn't think that it would match with the rest of the flavors in the dish. Then, I cut down on the salt, used water instead of vegetable stock, and used dried oregano since that's what I had. Finally, instead of mozzarella, I sliced up a couple of Babybel cheeses and put them on top. As far as I can tell, making these changes didn't diminish the flavor in this dish one bit. I have to say that this dish impressed me. Not only is it beautiful to look at, but it's a true pleasure to eat. The Babybel cheeses were perfect - so wonderfully melty. And I love that it's healthy. 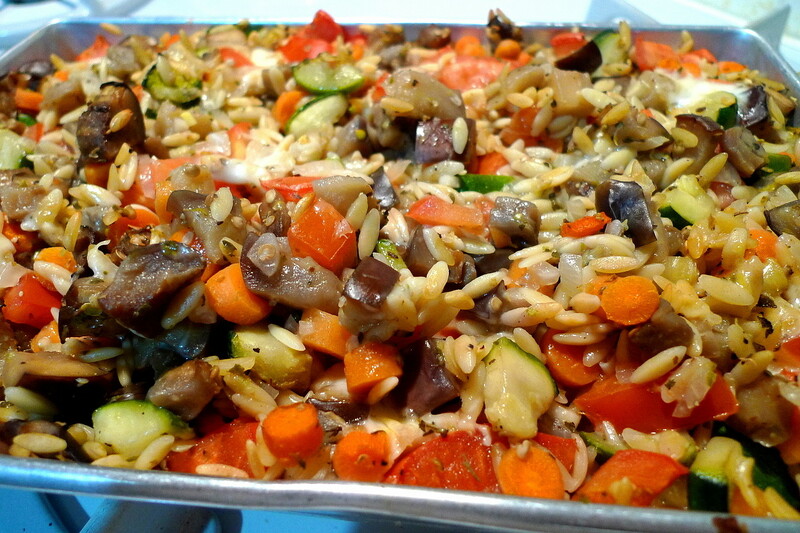 To up the health factor, next time, I'd probably use whole wheat orzo and add in some spinach and mushrooms too. You could probably even use some broccoli or cauliflower to mix things up a little. You can never have too many veggies, at least in my opinion. With a dish like this, I promise you won't miss your meat. Preheat your oven to 350°F. Heat a large frying pan over medium-high heat. Once hot, add the oil and saute the eggplant and zucchini. When done, remove from pan and set aside. Add carrots to remaining oil and cook for 3 minutes before adding onion and garlic. Cook together for 5 more minutes on medium heat. Stir in the orzo and cook for two minutes more. Off the heat, add the oregano, tomatoes, eggplant, zucchini, lemon zest, 1/2 teaspoon table salt, many grinds of black pepper and the water and mix well. Transfer mixture to an 8×11-inch (about 2 quarts) ovenproof baking dish. Slice the Babybel cheeses and stick the pieces into the pasta-veggie mixture as desired. Cover with foil and bake 20 minutes, then bake 20 minutes without the foil. (You can increase the ration of foil-on to foil-off time if you don’t like a crunchy pasta lid.) Let rest for 5 minutes before serving. 1. The original recipe calls for you to fry the eggplant. I just used 2 Tbsp. olive oil and sauteed the eggplant. 2. The original recipe called for 1 tsp. tomato paste, celery, 1/2 c. parmesan cheese, vegetable stock, and fresh oregano. I left out the tomato paste, celery, and parmesan cheese, used water instead of the vegetable stock, and used dried oregano instead of fresh. I have to admit, when I started searching Cupcake Muffin's blog for this month's SRC, I was like a kid in a candy store. Oohhh ooohhh look at all the yummy cookie recipes, I want that! Wait, wait, look at all the delicious cake recipes, I want that! What? There's more sugary stuff over there too? What they hey, I'll just take all of it. Consequently, I didn't make just one recipe from Sara's blog, I actually tried three different ones over the course of the month. But, one of those recipes was one that she made for her SRC before, so I chose not to showcase that one. 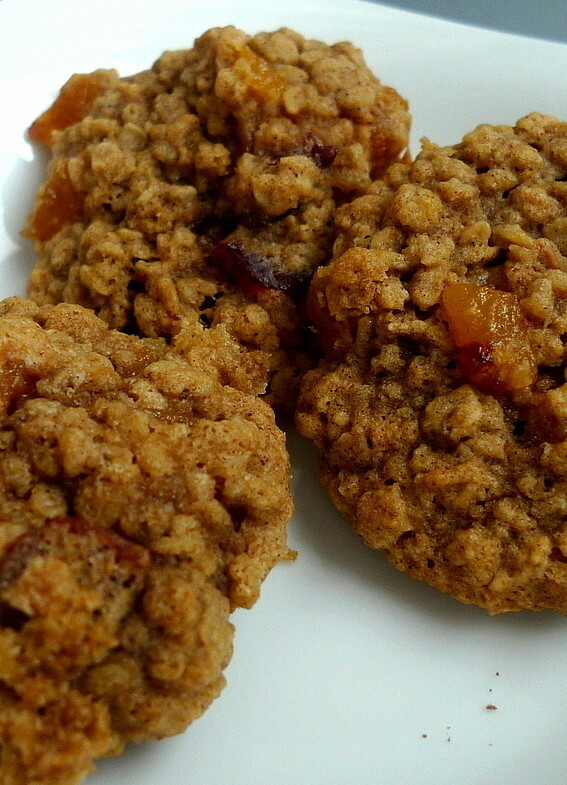 Instead, I bring you some amazing Spiced Oatmeal Cookies with Dried Cranberries and Apricots. I teach a group of teenage girls and I like to make their birthdays special by presenting them with an assortment of cookies. 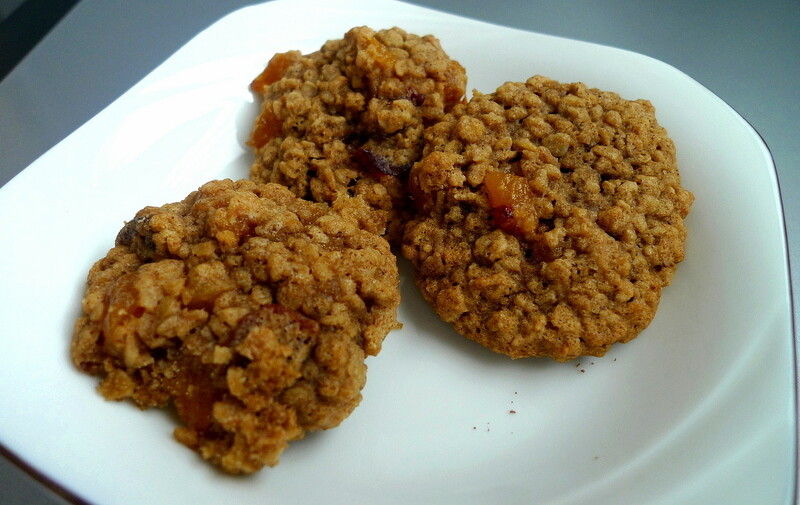 Each month, I change things up and try new recipes and Sara's oatmeal cookie recipe looked like just the thing to make. I didn't have any dried cherries, but I did have some dried cranberries, so I added those in instead. I also didn't have any cardamom on hand, so I subbed in some ginger powder. These cookies came out just like the ones in Sara's picture, all thick and chewy and full of orange and red bits of fruit that looked like jewels. My mom saw them cooling on the counter and, after asking if it was alright to take one (she knows I gotta take pics first), promptly declared that they were really good! I ate one myself and boy was she right. Even better, these are totally healthy - just bursting with fiber, antioxidants, and vitamin C. Okay, maybe you don't care about that. In that case, they're bursting with flavor, fruitiness, and spiciness that can't be beat. Sara, your cookies rock! My tastebuds thank you. 1. Whisk together the flour, baking soda, salt, cinnamon, nutmeg, and ginger powder and set aside. 2. Beat together the butter and sugars until smooth and creamy. Add the eggs one at a time, beating after each addition. Add the vanilla and beat to incorporate. 3. Add the flour mixture and stir in with a rubber spatula until the flour is mixed in enough not to fly out of the mixer. Then beat until just incorporated. Add the oats and beat until just combined. Stir in the cranberries and apricots with a rubber spatula. 4. Cover the bowl and chill at least 6 hours or overnight. 5. When ready to bake, preheat the oven to 375 degrees and line two baking sheets with foil or parchment. 6. Scoop out about 1 tablespoon of dough per cookie, and gently roll into a ball with your palms. Bake 10-12 minutes, rotating the pans halfway through, until the cookies just begin to brown.